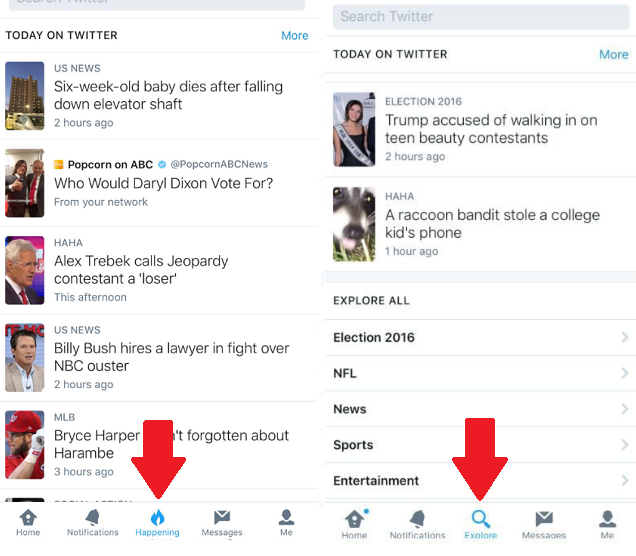 Back in October, some Twitter users reported seeing different variations of the app in test mode where the Moments tab had been replaced - in one iteration by a 'Happening' tab and in another, one called 'Explore'. Moments were still listed, as you can see from the image, but the new tabs combined live video, 'Trending Now' and Moments into one section - and in that order - effectively de-emphasizing Moments. Evidently those tests were successful - Twitter has today confirmed that the 'Moments' tab will soon be no more, replaced by an 'Explore' tab that'll also be shifted from the middle spot. As you can see, the order is as noted, with live video getting priority, helping Twitter continue their streaming push. Moments is still there, but it's further down the page. And it no longer gets its own tab. For Twitter's part, they say the change is designed to streamline the discovery process - another step in making Twitter easier to understand. "Until today, you had to go to a few different places to find each of these experiences. As part of our continued efforts to make it easier to see what's happening, we're bringing all these together. Very soon, you'll be able to find trends, Moments, search, and the best of live video, all within the new Explore tab." 'Simplify the product', as you may recall, was noted as priority number one by CEO Jack Dorsey last year, while this new option also aligns with priority number two on Dorsey's list: 'Maximize live video'. But as noted, it also means Moments is shuffled to the back. Which is disappointing. Originally called 'Project Lightning', Moments was seen as a key way for Twitter to solve one of its core issues - that being the perception that Twitter is too difficult to understand for non-users, the people they most need to appeal to in order to boost their stalled user growth. But despite their efforts to push the offering - which included running their first ever TV ad to promote it - Moments has failed to catch on as they had hoped it would. That's not to say Moments has completely failed, the option will still be available within the 'Explore' tab, and you'll still be able to create your own Moments. But this update clearly signals that users are not engaging with the Moments tab at a high enough rate to justify that prominent in-app position. "Over the past year, we've been exploring different ways to make it simpler for people to find and use trends, Moments, and search. During our research process, people told us that the new Explore tab helped them easily find news, what's trending, and what's popular right now." The demotion of Moments also seems to go against the wider trend towards more storytelling type devices in social, ways to string several posts together into a more comprehensive, narrative-style update. This started with Snapchat Stories, which has since been adapted by Instagram, Facebook Messenger, and soon Facebook itself. Instagram Stories, in particular, has proven very popular, with 150 million people now using the option every day. Twitter doesn't have a Stories option, as such, but Moments was their closest thing to it - yet despite those wider audience trends, and Facebook obviously seeing big success with the Stories format, Moments just hasn't caught on. There is still opportunity in Moments, there are ways brands can use the option to good effect, but the demotion will likely see it de-emphasized by users also, which will make it a less appealing draw. Part of the problem for Moments was that it wasn't open to all users from the start, but the bigger issue limiting Moments' take-up has been Twitter's failure to communicate it's potential, its context and position within our day-to-day lives. 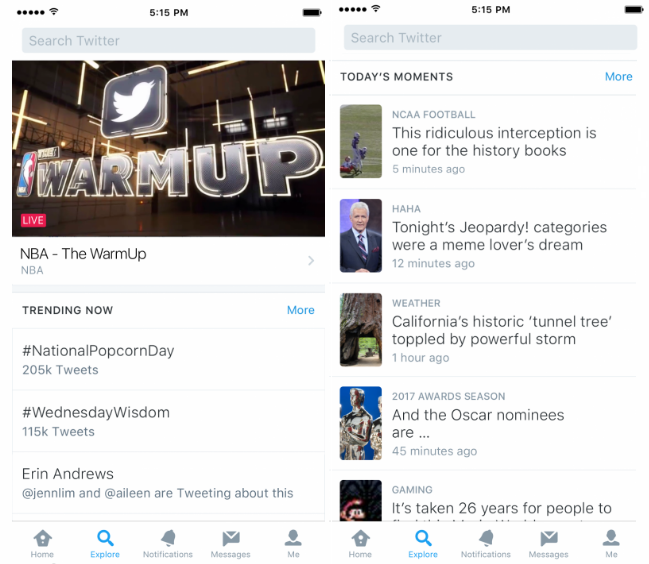 Why is Moments important? In this sense, the problems that have plagued Moments are much the same as the wider issues at Twitter overall. 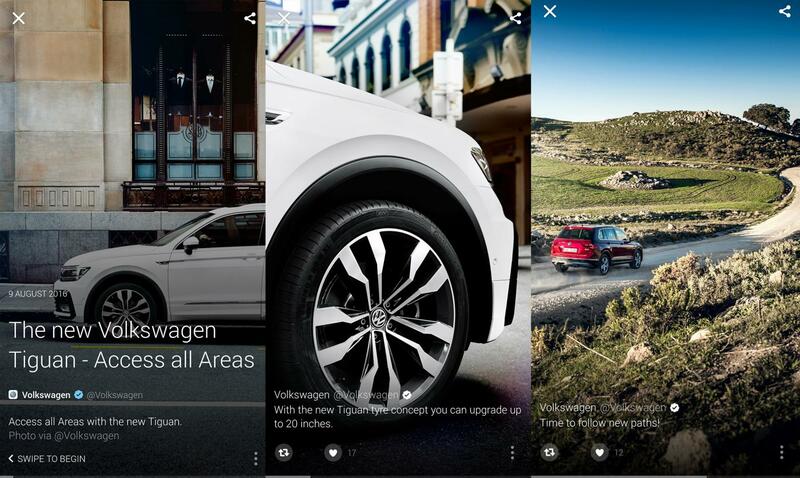 Explore will begin rolling out from today on Twitter for iOS, and in the coming weeks on Twitter for Android.